April is Earth Month at beautiful Biscayne Bay Campus and Jennifer Grimm, the campus’ environmental coordinator, spent some time on April 5 making creative statements with a group of students outside the Wolfe University Center. When we caught up with Grimm, she was stringing together empty plastic bottles that will hang from the trees in the area outside the center to represent the waste that humankind produces. 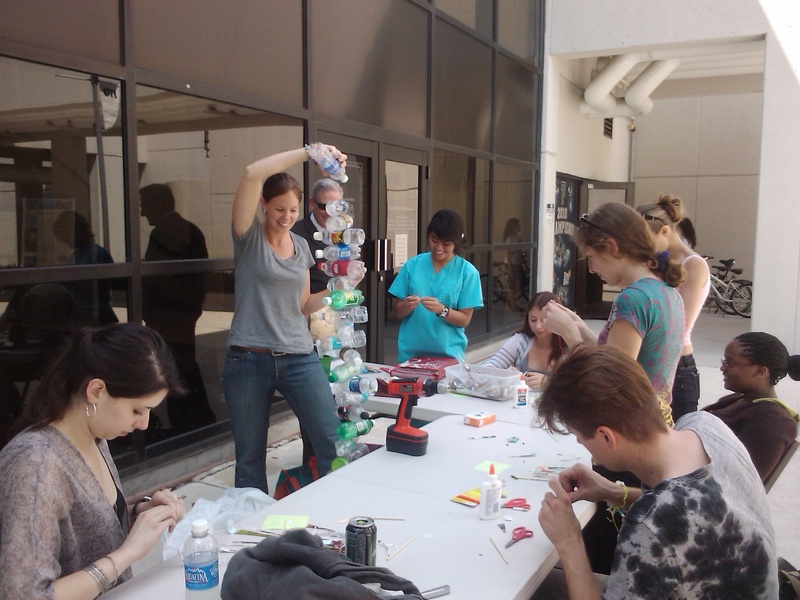 “In the United States, 1,500 plastic bottles are thrown away every second,” a sign read by the table where Grimm and a group of Panthers (some students of hers, others passersby on their way from class) also were working on bracelets made from reclaimed magazines. “We will string together 10 lines with 150 bottles each and hang them around to serve as a reminder of what we consume and throw away every day,” she told BBC Vice Provost Steven Moll, whose eye was caught by the green art. There will be a number of events at BBC to commemorate Earth Month. For more information, call 305-919-6000 or check out the monitors in AC I & AC II for event details. Wish you guys could have joined us at the Launch of the Office of University Sustainability.